Fig. 1. Expression of Skp2 upon actin damage-induced tetraploid G1 arrest. (A) Actin immunofluorescence and DAPI staining of HCT116 cells treated with PTX-2 (10 μM), cytochalasin D (10 μM) or psychosine (50 μM) for 24 h. (B) Western blot analysis of Skp1 and Skp2 proteins in HCT116 cells after treatment with actin inhibitors for the indicated times. (C) Skp2 expression in cell cycle-synchronized and asynchronously growing HCT116 cells. The cells were synchronized at early S phase by double thymidine treatment as described in Materials and Methods. 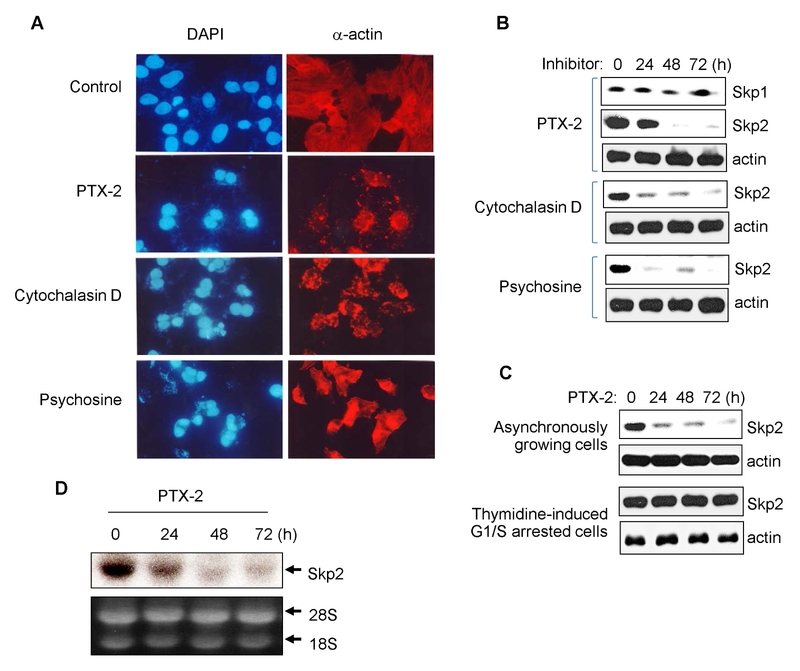 The cells were treated with actin inhibitor, PTX-2 for the indicated times, without release from early S phase synchronization. Protein levels of Skp2 were assessed by Western blotting. (D) Skp2 mRNA expression. Total RNA was obtained from HCT116 cells treated with PTX-2 for the indicated times and applied to Northern blot analysis for detection of Skp2 mRNA. 28S and 18S rRNAs were used for evaluating the quality and quantity of RNA loading.